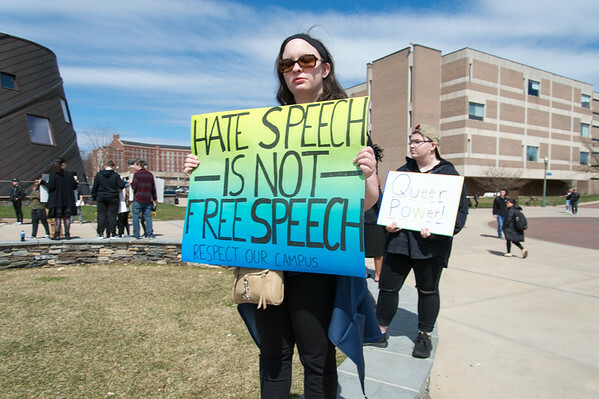 NEW BRITAIN - In a show of solidarity, students and faculty dressed in black marched around Central Connecticut State University Thursday afternoon demanding justice after racism and homophobia appeared on campus recently. The CCSU Black Student Union and CCSU Pride joined forces to organize the rally they named Blackout after the N-word was found spray painted on two separate buildings on campus. This coming just weeks after the college dedicated its Social Sciences Building to the first African American to graduate from the college, Ebenezer D. Bassett. Evelyn Newman-Phillips, a professor of anthropology, said she believes the graffiti represented a reaction to the building dedication. She’s been with the university for almost 25 years and said she has experienced racism at the school firsthand. Other students expressed anger over finding gay conversion therapy posters on campus last week. Francisca Presmy, a junior attending the rally, said she was disappointed in the graffitti investigation and said the college did not put in enough effort to find the culprit. Newman-Phillips disagreed, praising CCSU President Zulma R. Toro for taking an active stand. She said Toro has been meeting with faculty and staff to discuss short- and long-term solutions. “I’ve never dealt with a president that did that,” she said. “I think the university has come together to support both of these populations,” said Vice President of Student Affairs Michael Jasek. 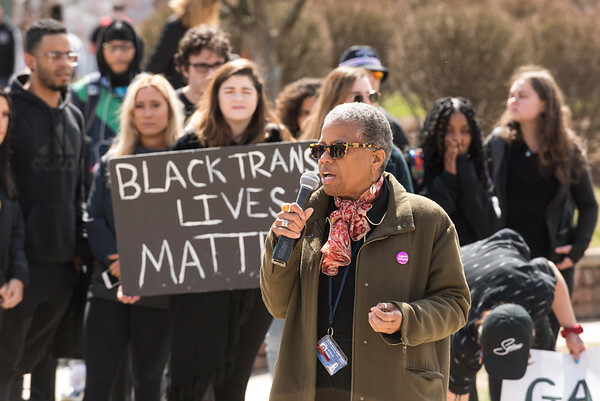 She went on to announce a plan to change CCSU campus culture, which includes the hiring of an expert in diversity, equity, and inclusion in higher education who will lead the Office of Diversity and Equity on an interim basis. In addition, she will be announcing a university-wide diversity and inclusion initiative. She also encouraged students to reach out to her office directly. “I applaud you all for taking a stand against hatred, and I encourage you to keep standing up for what is right. This conviction is exactly what we hope to see in our students - in all members of the Central family, and I know, thanks to you, we will achieve our goal of creating a welcoming and supportive learning community for all,” Toro added. CCSU Police at the rally said it was a peaceful protest. “I think this is the biggest rally I’ve seen in 20 years,” said CCSU Police Sgt. Jerry Erwin. Erwin declined to comment on the status of the graffiti investigation because it is ongoing. Posted in New Britain Herald, New Britain on Thursday, 11 April 2019 20:52. Updated: Thursday, 11 April 2019 20:54.